Halloween is next weekend! Do you have your costumes ready yet? Now is the perfect time to give your handmade creations a trial run, and don’t forget to take some pictures to share on our Green Halloween® contest site. Upload your best shots for a chance to win great prizes including an Oeuf Mask & Tail set, Yummy Earth lollipops, FEED Trick-or-Treat Bags to Benefit UNICEF, eco-friendly Halloween bags from ChicoBag, and Inhabischwag — all this for your fabulous DIY costume crafting trickery! Good luck! 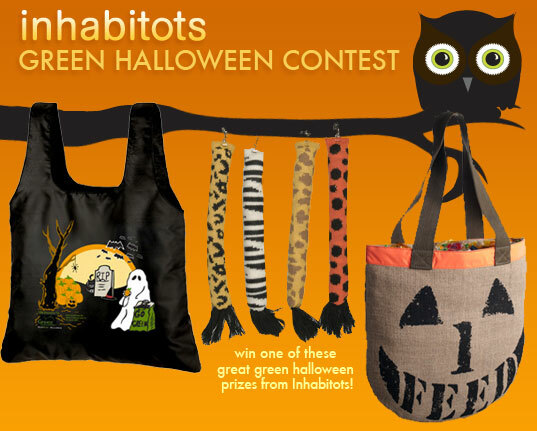 Don't Forget to Enter Inhabitots Green Halloween Costume Contest! Halloween is next weekend! Do you have your costumes ready yet? Now is the perfect time to give your handmade creations a trial run, and don't forget to take some pictures to share on our Green Halloween� contest site. Upload your best shots for a chance to win great prizes including an Oeuf Mask & Tail set, Yummy Earth lollipops, FEED Trick-or-Treat Bags to Benefit UNICEF, eco-friendly Halloween bags from ChicoBag, and Inhabischwag -- all this for your fabulous DIY costume crafting trickery! Good luck!